I just recently stumbled upon Mystic Magic. It is a fashion brand that has a unique look and has up until now only produced masks and headwear. They are looking to venture into the world of clothing, while keeping with their very creative vibe. They are currently campaigning to raise enough funds for their clothing creation dreams, and they need some help. The campaign ends on June 25th, and you can access it here. There are gifts given to those to contribute to their clothing fund. And if all goes well, they'd like to be in London Fashion Week. I think it is important to support young emerging artists, and this chap is 21 and from the UK. The brand Mystic Magic is edgy and has a very distinct look, which is so important in the fashion world. As I am a huge art and art history lover, I can appreciate a creative fashion brand that is formed by such a passionate individual. Follow the link to view their campaign and to learn about their fashion brand! Good luck Mystic Magic on your campaign! I wish you all the best! Here's a link to their own website if you'd like to see what their currently sporting. PS. I'm doing a twitter chat at 1200 EDT tomorrow June 9th so please join in with the hashtag #ltbloggers. Find me on twitter @melodyyannep. Good morning! Before I get started on today's delicious weekend baking recipe, I just want to remind everyone that I'm hosting a twitter chat on Tuesday June 9th at 1200 EDT. Please join in on the chat and you can follow me here. 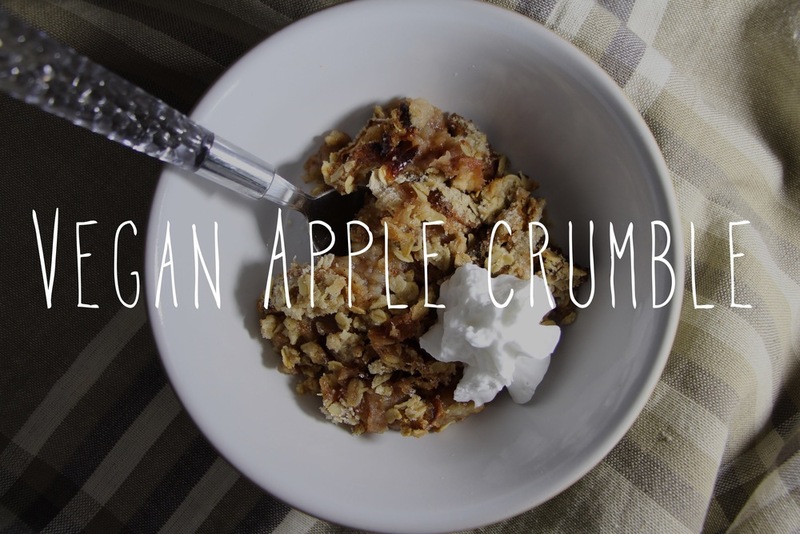 Without further ado, let me introduce the Vegan Apple Crumble to you. This is an insanely easy recipe, that essentially can be done with any fruit. It's delicious, cozy, and makes for a great dessert or breakfast! To start, preheat your oven to 350 degrees. Grease your baking dish, and mix together your ingredients for the fruit component of the crumble. While the apples are releasing their juices and getting infused with flavour, mix together your dry ingredients in a separate bowl. Add in your cold vegan butter to the dry ingredients, and massage between your thumb and index finger. You want the mixture to resemble coarse crumbs. Once this is complete, add your apples to the greased dish and spread the crumble mixture on top. Bake for about 50-60 minutes or until the apples are bubbling and the top is golden. Once out of the oven, serve warm with ice cream, coconut whip cream, or just plain because it's simply that delicious! Follow me on instagram for updates on the blog and lots of food pictures. P.S. Check out my video on Vegan Overnight Oats that are flavoured like an oatmeal raisin cookie here! Please give the video a like and subscribe to my channel! The Confessions of a True Womanizer is a Romance/Drama about a young man name Romeo Roosevelt that tries to find his way into treating women right. Romeo grows up watching his father romance his mother and other women. Romeo admires his dad’s abilities to be a smooth ladies man. Romeo of course wants to grow up being a ladies man just like his father. Romeo is blessed with his father’s handsome looks and as he grows into a man, he takes advantage of that. Jumping from woman to woman, confused on how to really stay faithful to a woman because Romeo was never taught how to truly treat a woman. Romeo reunites with a long lost love and tries to get his act right just for her. The question is; will he be able to? This is an incredible story of a young man trying to find himself after growing up in a drama filled household. Romeo Roosevelt is the main character that a lot of men can relate to in real life. A father figure is so important in a young man’s life and this story is a prime example of that. This novel is for everyone to read. No matter your race, gender, background, culture, etc. This is an enjoyable read for people who love great stories with great morals to it! This book has twenty something enjoyable chapters. The character Romeo in this book has a coming of age feel to him. While he is a grown man he still has a lot to learn about people as well as himself and how to be his own man. The story follows him around as he learns this as well as how to love the woman he is with. The writer of the book really understood how to make a reader care about the characters. as I was reading this book I began to care about Romeo as if he were an actual person. The creation on the character was great. While the book was great overall I do wish that there was more to the woman he was falling in love with. The writer made her a really great character he did not make her as deep as he did Romeo. It would have been nice to read a little more about why he loved her and who she is. She needed a bit more development as well. The story was very unique, while it may sound a bit cliché when you think of the plot the author made it work effortlessly, holding the reader’s attention the entire time. Overall this book receives 4.5/5 stars because it really is an amazing story, I enjoyed reading every moment of it and I’m sure you will too! The characters are relatable and really great and the author really knows what he is doing. Rene loves hiking, her cat ambush and her husband. not in that particular order. She also enjoys blogging about Books, Movies, TV shows and video games on her Blog http://Renereviews.com. If you want to get in touch with her you can contact her there. Italian food is all about simplicity, fresh flavours, and using ingredients you already have. Today's post shows you Italian cooking in the purest form as shown by my Nonna. She's really an allstar when it comes to the kitchen, not to mention she is just the cutest thing! If you like Italian pasta dishes, and love simplicity, then keep on reading! To begin, pick out 1 large pot for the pasta and 1 large pan for the sauce. For the sauce, heat up the olive oil in the pan on high heat, then add the garlic and onions. While the garlic and onions soften, fill up your pot with water and boil on high heat. Add the good pinch of salt now to the pot of boiling water. To continue the sauce, add in all of the tomatoes, chili flakes, pepper, and salt. Keep stirring the sauce so the flavours can develop amongst each other. Add in the parsley. At this time you put the spaghetti in to cook. Add in a tbsp or so of the pasta water into the saucepan, and keep stirring gently. Once the spaghetti is al dente, drain the water and add to the saucepan. Combine the pasta and sauce well. Add in the basil, and you can serve! Boun Appetito! If you enjoyed this post, please give it a like! Leave any comments down below! Send some love to my nonna! Follow me on instagram and twitter. Big news! I will be hosting a blogger chat on twitter on June 9th at 13:00 EDT so please join in! To start, preheat your oven to 325 degrees. The lower temperature ensures that the inside of the loaf will bake through while the outside doesn't burn. Beat the butter and sugar together until a creamy yellow paste forms. Add in each egg one at a time. In a separate bowl, mix all of the dry ingredients together. Once the eggs are incorporated, add in the bananas and pecans. Once the bananas and pecans are mixed in, add in the dry ingredients. When all is incorporated well, pop the batter into a greased 1 pound loaf pan, and bake for around 1 hour and 20 minutes. After the 1 hour mark, just keep checking the centre of the loaf if it is cooked through. Once the centre is cooked, take out of the oven and enjoy! 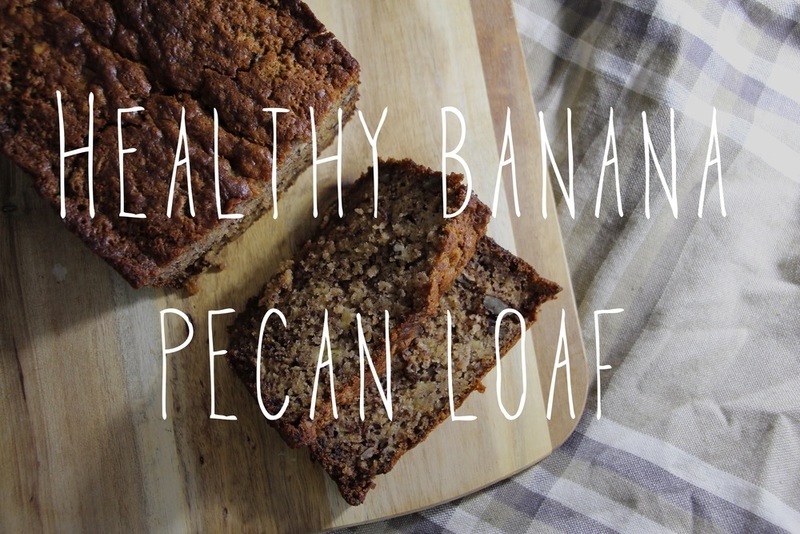 I like my banana bread with cream cheese or even peanut butter. This is a recipe that will surely impress anyone that tries it! There is something so satisfying about oatmeal. The first is that it is so filling since it's full of protein and fibre. But the second is that the sky is the limit with the endless flavour combinations and toppings. Oatmeal is a great way to start your day, and you should have fun with it. I have two sets of topping combinations that are my favourite. Plus, they cover areas like fruity goodness, crunch, saltiness, and sweetness. The first is a regular bowl of oatmeal that is made creamy with almond milk, and it is topped with sliced strawberries, a teaspoon of peanut butter, a teaspoon of shredded coconut, and 2 tablespoons of hemp hearts. The second bowl of oatmeal is also creamy, and has a tad of maple syrup mixed within it for a little bit more sweetness. It is topped with a sliced banana, 2 teaspoons of granola, 2 teaspoons of goji berries, and 2 tablespoons of hemp hearts. Both bowls make excellent breakfasts, lunches or even dinners. I crave oatmeal all the time and these two combinations really hit the spot. How do you like your oatmeal? What toppings do you like? A smoothie should be refreshing and nutritious. Load up your blender with fruits and veggies and you can't go wrong. Try these easy recipes and let me know what you think in the comments! Follow me on instagram and twitter. Good morning! I realize when I say good morning it may not apply to everyone as the internet is not limited to time zone so if it is not morning for you, I'm still sending you good vibes! For today's weekend sweets, we have the raw, vegan, and gluten free chocolate caramel squares! 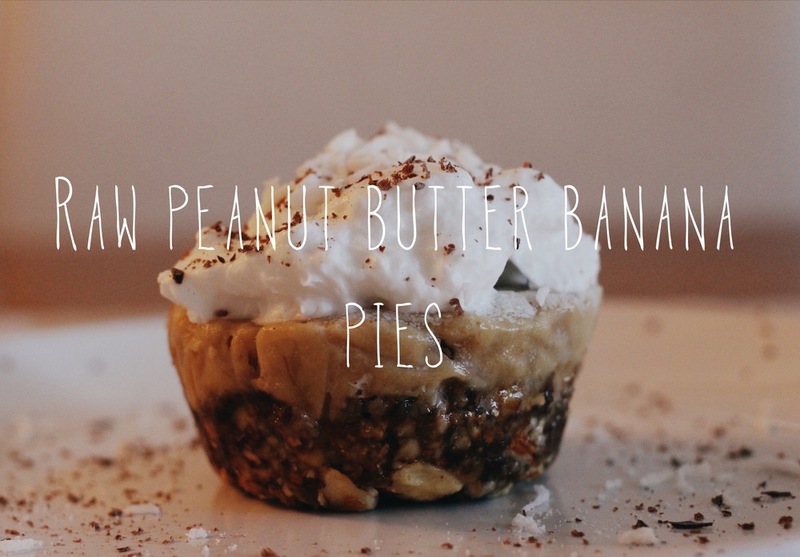 These are delicious, pretty nutritious, and super easy! All you need is a food processor, and the sky is the limit! My inspiration for this recipe is from Emily von Euw's Rawesome Vegan Life blog. *This recipe is based on a square pan. To start, line a square baking pan with parchment paper. Mix together the crust ingredients in a food processor until the mixture resembles a ball. Press the mixture into the base of the pan, and chill in the fridge. While the crust is chilling, make the caramel mixture. To do so, add all of the ingredients into a food processor and mix until there is gooey caramel! The caramel should be sticky and not too thick. Add on top of the crust, and chill back in the fridge. For the chocolate layer, mix everything together in a bowl, and you have your very own chocolate! Add the chocolate evenly over the caramel layer. Chill everything for at least 12 hours, and once ready to serve cut into squares. I think this is a great dessert, but also a wonderful snack, protein bar, breakfast - really it could be anything. 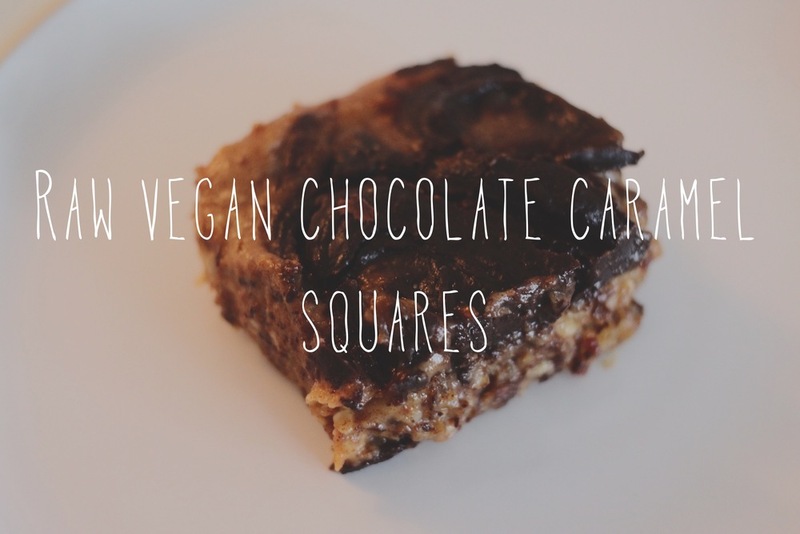 These squares are delicious and really do fool you into thinking there's refined sugar and other bad things. I don't know about you, but when it comes to a meal, I like variety. I think it's important to have different textures, flavours, and spices used in one meal to make it as delicious and interesting as possible. With that being said, I bring you the Buddha Bowl (version 1)! This Buddha Bowl is filled to the brim with lots of filling and hearty veggies, rice, tempeh, nuts, and hummus goodness! To start, preheat your oven to 380 degrees. Line two baking sheets with parchment paper. On the first, place the sweet potato mixed with oil, salt, and spices. On the second, place the zucchini dressed in oil, salt, and spices, and the shallot with oil. Bake for 30 minutes or until crispy and cooked. At the same time, make your rice or quinoa. I was lucky enough to have both on hand so I skipped this step at this time. Season your tempeh with some paprika, and cook in a pan until cooked through. Do this within the last 5 minutes of the vegetables cooking. Once everything is cooked, prepare your bowl. The bottom of the bowl will hold the rice, and next layer on the vegetables and tempeh. In the centre, I added the seeds, pistachios, and homemade hummus. Enjoy! You can make this buddha bowl with whatever veggies you have on hand. The combinations are endless, and so are the health benefits. Try making a buddha bowl and see how it transforms your evening! Happy Sunday everyone! If you're anything like me, you love cookies. I could eat cookies all day everyday, and be the happiest person ever. Except, I'd probably gain lots of weight, and my skin would suffer, and it would just be a bad time. I have figured out the solution... healthy cookies! These vegan and gluten free oat cookies with a peanut butter drizzle are healthy, delicious, and contain no refined sugar! That sounds pretty good to me. To start, preheat your oven to 350 degrees and line a baking sheet with parchment paper. Mix together all of your ingredients until it forms one ball of "dough". Using a tablespoon scooper, measure out your cookies and place onto the baking sheet. Bake for 10-15 minutes or until golden brown. Once cool, melt some peanut butter and drizzle over the top of each cookie for extra deliciousness and some prettiness. These cookies are great to have for breakfast, with an afternoon tea, or even after a workout as they're full of protein and omega. These will become a staple for you if you're a cookie addict like me. PS. Go and watch my first youtube video here. And give it a like and leave a comment! I don't think there's anything more comforting than soup with a grilled cheese. It covers all areas of warmth, cheesiness, veggie goodness, and plain deliciousness. For today's post, we have an easy tomato soup recipe with grilled cheese croutons! To start, place all of the soup's ingredients in a pot (except for the creamy addition if using). Let the veggies cook for about 10 minutes on a medium heat. Once everything is heated through, use an immersion blender or a blender to mix up the soup to a smooth consistency. Place back into the pot, and heat through for another 20-30 minutes to let the flavours develop together. If you want to add the cream or almond milk, add now, and stir well. Before you serve, make your grilled cheese. Heat up a pan on medium heat, and butter both pieces of bread. Put one slice butter side down in the pan, place cheese on top, and other piece of bread (butter side on top). Flip when the bottom slice is golden, and grill other piece of bread until same golden brown. Cut your grilled cheese into same squares and top your bowl of soup with them! This soup is so easy to make, is light on the wallet, and the grilled cheese croutons add such a nice touch. It's delicious, can be vegan, and is a great lunch or dinner any day of the week! Good morning and Happy Mother's Day! Today is going to be a busy day for me as I'm celebrating with my mom, grandmother, and aunts. Lots of flowers and gifts to be given, and food to be eaten! For an easy and raw weekend recipe, I made mini strawberry cheesecakes! These are so simple, can be made a day in advance, and are really light on the wallet. To start, mix the crushed graham crackers with the melted butter. Divide evenly into mini mason jars or a muffin tin, and press the mixture down. Place in the fridge for 20 minutes so the crust can harden. In the meantime, mix the cream cheese, mascarpone, and sugar until light and fluffy. Once the crusts have cooled and hardened, divide the cheese mixture and place a spoonful on top of the crusts. Place in the fridge for at least 2 hours so the cheesecakes can solidify. When you're ready to serve them, top with the sliced strawberries and whole strawberries! These are refreshing but still like a comforting dessert. They're cute as individual cheesecakes, and I think they will impress any guests you have. They take any stress away from baking, and will become one of your favourite warm weather desserts! PS. There is a vegan version of this recipe coming soon as well! Today is Bingley's birthday and he turns four! For his birthday, he's getting a little party, lots of gifts, and I made his favourite, flourless peanut butter cookies! He's allergic to wheat among lots of other things so this recipe is perfect for him. If you'd like to see that recipe, check here. 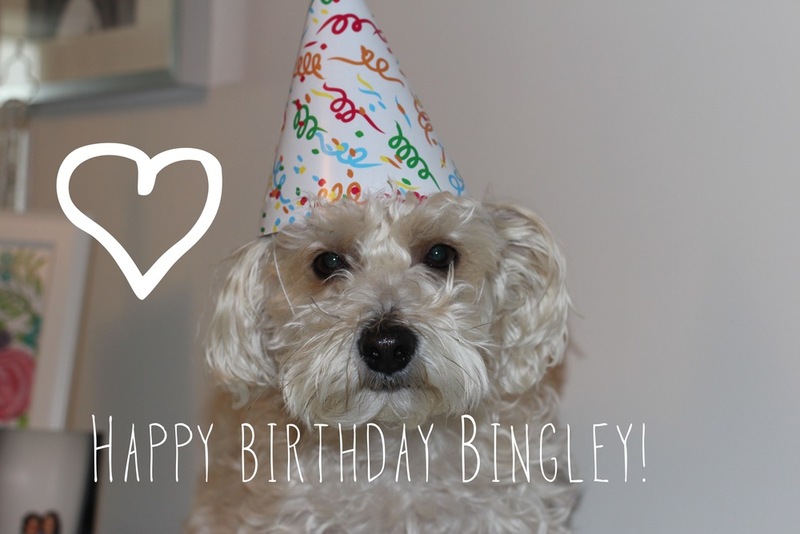 Follow me on instagram and twitter for Bingley birthday cuteness and for new posts! Happy birthday Bingley! Mother's day is right around the corner (just in case you forgot, its this Sunday May 10th), and if you need some ideas for gifts or what to do with your mom, look no further! Here's my post from last year that will definitely help you out. For today's beauty post, I'm raving about the Body Shop's Camomile Cleansing Butter. This stuff is like gold! You take a little bit in your hand, rub it together, and massage it into your face. It turns into an oil/foaming mixture and takes off even the most stubborn eye makeup. It moisturizes your skin, and you can just rinse it off. If its a late night for me, I'll just cleanse with this and not do anything else. My skin in the morning looks great and isn't dry at all even though I haven't used moisturizer (and I have dry skin). It's regularly $16, but I got it for half off, which is such a steal! It lasts forever, and can rival any high end brand! Definitely worth a purchase if you're looking for an all-in-one makeup remover! Good morning everyone! Today I bring you a delicious recipe from Deliciously Ella that I tried and tested. The recipe is for Sweet Potato Brownies. They're healthy, chocolatey, and surprisingly great. Give them a try and you won't be disappointed! To start, preheat your oven to 350 degrees. Peel, cut, and steam the sweet potatoes until soft and tender. In a food processor, whiz up the sweet potatoes and dates until it becomes a creamy mix. In a separate bowl, add all of the remaining ingredients and combine well. Add in the date and sweet potato mix, and combine. Place into a lined square baking pan, pierce the brownies with a fork, and bake for 20 minutes. Allow for them to cool at least for 10 minutes before you remove the brownies from the pan; they are delicate. Enjoy these brownies as an afternoon snack or dessert! They're healthy, gluten free, and vegan! They're simply delicious. Dates seem like they're all the rage these days. They're good for you, taste delicious, and sweeten up any dessert. 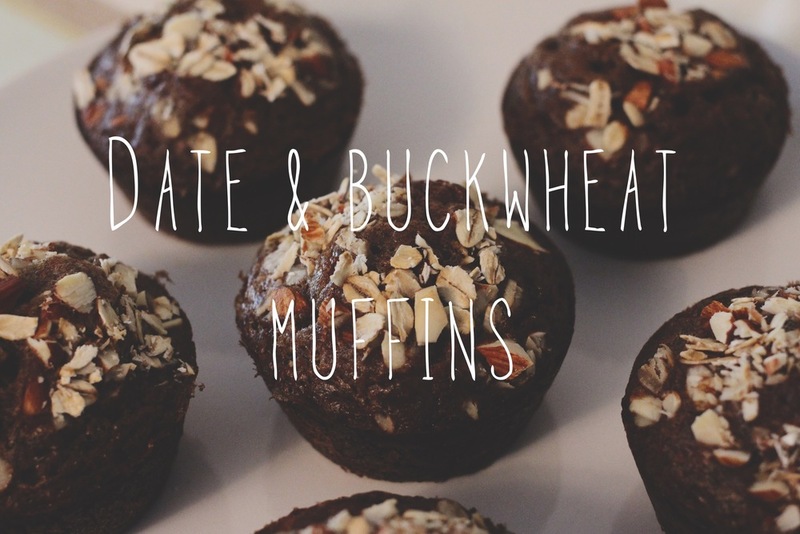 Buckwheat is also gluten free and supremely good for you. So I'd like to deem these muffins, healthy! They're also very yummy, and can be made in a snap. Not to mention, there's no sugar added! To start, preheat your oven to 350 degrees. In a pot, heat up the almond milk, chopped dates, and baking soda. Let it come to a boil, then simmer for 1 minute. Let cool a little bit then add to a food processor to make into a paste. In a bowl, mix taught the rest of the ingredients, except for the almonds and oats. Add in the date paste, and combine well. Grease or line a muffin tin and divide the batter equally. Top with the almonds and oats. You should get about 6-8 muffins out of it. Bake for about 20 minutes or until the centre is no longer wet. Let them cool for at least 10 minutes before removing from the tin. And enjoy! Good afternoon everyone! As I continue with these weekly beauty posts, I have to include some dry shampoo. I live off of dry shampoo. I have very straight, flat, and consequently, oily hair. I usually wash my hair every 2-4 days, and definitely need some help to extend the life of it. Before the dry shampoo rage, I would use baby powder with cornstarch, and it still works well when I'm in a pinch. This dry shampoo by Tresemme is great for flat and straight hair. It adds volume, has a great gentle scent, and really takes away the oiliness. It doesn't make my roots feel more gritty. I use it on bobby pins if I need some extra hold, and can use it on clean hair if you're putting your hair in an updo. It's overall just an amazing dry shampoo, and doesn't break the bank. I use small cans of it and keep them in every bag I have. What's your favourite dry shampoo? There's a lot more beauty posts up on the blog these days. And this is because I've found some beauty staples that are amazing and affordable. Today's review is on the Maybelline Colour Tattoo Eyeshadow in Bad to the Bronze. This shade is perfect for daytime. It is perfect for nighttime. It is perfect for layering or wearing by itself. It is all around amazing. It's so versatile, and is really easy to apply. I just apply it with my fingers on my eyelid. You can make it smudgy if you want to achieve a smoky eye look or use it as a little oomph for everyday. It also comes in way under $10 and I'm sure it will last forever. This shade is a great neutral for anyone, and since it has a little bit of shimmer it really does well at opening up the eye. Definitely worth the buy! To start, line a muffin tin with cling wrap or parchment paper. Blend the cream filling in a blender until smooth & set aside. Place all of the crust ingredients into a food processor and whaz everything up until a ball forms. Separate the crust into each muffin cup and pat down well. Separate the banana mixture on top of date crust. Put in freezer for at least 4 hours or overnight. To serve, I added coconut whip cream, shredded coconut, and dark chocolate shavings. This is a super easy dessert to make, and it tastes amazing! You can make it ahead of time, and it will hold for a 2-3 days in the freezer. Let me know what you think about this dessert in the comments below.